For a project of this magnitude, even a summation might not be sufficient! I know this is deviating a bit from my usual style for a review, which would be to introduce the product with a bit of musing on pop culture or literature before I segue way into the heart of the matter. But in this particular case, there is simply too much to discuss! Now, I’ll admit that I feel fairly fortunate to have received a pre-release copy of the new Amethyst: Foundations by Dias Ex Machina/Goodman Games. Ever since the preview of the system Combat Advantage # 15, in a scenario called Bio-Hazard, I have been way more than a little curious to find out what Amethyst is all about. As I discussed in my blog, the Bio-Hazard Preview was a zombie-pocalypse style adventure, featuring the new “modern” classes which will appear in Amethyst. Despite the tantalizing pre-generated classes, with names like Grounder, Operator, and Marshall, there was still not a lot to go on about what the final product, Amethyst: Foundations was going to be like. Let me assure you of this, my fellow D&D enthusiasts: this game is not a 4E zombie-pocalyse game! More than five years in the crafting, according to one of my sources, this game is nothing like my pre-conceived notions thought it might be. And yes, I am aware that “five years” doesn’t make a lot of sense, considering that D&D 4E has not been out for that long yet. 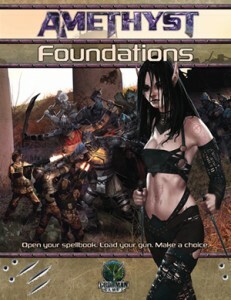 But Amethyst: Foundations by Dias Ex Machina is also considerably more than just an adaptation of the D&D 4E rules to a modern setting! Amethyst: Foundations is a campaign setting and rulebook, which is compatible with D&D 4E, and combines sword-and-sorcery-fantasy with not-too-distant-future-science-fiction into one massive adventuring world. Amethyst: Foundations details ten new Player-Character Races unique to the setting, and four new Character Classes, complete with an array of unique powers, which evoke a modern para-military feel. In addition to the new Character Classes, the rulebook contains 19 new Paragon Paths for use with both the new modern-themed classes, as well as with fantasy-themed classes. There are new Feats, new technological equipment, and new rituals, as well as some new Lifepaths, which are similar to Backgrounds for D&D 4E Characters. As a sourcebook, Amethyst: Foundations gives detailed information on playing the new races and classes, as well as background information on the history of the world, and its current physical and socio-political landscape. This includes a fairly extensive section on new Monsters which now inhabit the world, ranging from dragons to robots and fey to undead. And there are a few sample adventures to assist Game Masters in getting a feel for the new world they are running. For the world of Amethyst: Foundations is our own planet Earth, but strangely altered by a cataclysm and the return of magic. In general, I found the production quality of Amethyst: Foundations to be very good, with a design and layout which is appealing, and rules information presented as to be readily familiar to D&D 4E gamers. The artwork is incredibly stunning, despite almost all of it rendered in gray-scale, and it really enhances the sourcebook’s appeal. The writing is sharp and engaging, although there is a lot to take in, particularly when first sitting down to read the book. Many concepts introduced early are later explained in detail in later sections, but the initial chapters feel a bit like an information onslaught, with many new terms, names, and game mechanics fired at you fairly quickly. I personally would have preferred to see the Author add references in the early introductory material referring to later chapters, allowing readers to investigate an interesting term or concept at their whim, rather than have to go through the book linearly. I tend to read sourcebooks in a haphazard fashion, jumping between sections as my interests lead me. Amethyst is a Role Playing Game that postulates what would occur if a true-to-book fantasy setting was forced upon our real world. Our world is populated by many people wanting more from their lives. Our fantasies are filled with nymphs, valiant knights, and fire breathing dragons. We dream about being carried away by the fancies our mothers tell us every night. But what if it was real for everyone? What if it invaded our society? How would humanity truly respond? This is not some stylized, fanciful view of Earth seen in books and on TV. It is a world with all the problems, both social and political, intact. Would we welcome the world of fantasy into our lives or would we fear its very presence? The setting of Amethyst relies on its clash between magic and technology. Many fantasy worlds blend the two, usually with magic gaining the foothold and technology falling behind. Many deal with a mixing of the two worlds. Amethyst presents a setting where the two sides stand almost at war and – from a metaphysical point of view – actively disrupt each other’s existence. In Amethyst: Foundations, the fae world was part of earth’s prehistory before a cataclysmic event, in the form of a huge meteor, wiped the Earth clean of life, and any proof the fae had existed. This occurred during a time of terrible magical strife, when the fae peoples and dragons were fell under the influence of two gates, portals into realms of dark and light magical energies. The “dinosaur-killer” asteroid , called the First Hammer, forced the fae to flee through gates the realms of magic – and yes, the fae were around before mankind, in the era of dinosaurs- and so escaped the devastation, waiting to return when the Earth had been healed. The current world setting of Amethyst: Foundations is several centuries after the fall of the Second Hammer – another meteor which struck the Earth in Siberia, and nearly causing the extinction of the human race! However, the Second Hammer’s fall exposed the dark magic gate, called Ixindar. The light magic gate of Attricana appeared in the sky, resembling a star like object near the moon. And with the gates re-opened, magic returned, as did the fae, and the world was forever changed. I’ll admit that I like the Author’s design of an apocalyptic nature in the world-setting, where the humans who abhor magic have sheltered themselves into city-states called bastions. Yet there are other humans embrace magic and live alongside the fae in the world, which has become somewhat savage and wild since the Second Hammer. There is a real ideological conflict to which side is right: magic or technology. But even beyond that, there is a conflict between the forces of the two gates, opposite poles of light and darkness, of good and evil, which will continuously affect the world and those heroes that arise within it. Fae Races – the races which pre-date mankind, and were born from magic. Evolved Races – these are humans that evolved without magical influence. Spawn Races – creatures that have been altered by the effects of magic. Player-Character Races come from the first two categories, with monsters falling into the “Spawn” designation. While Amethyst: Foundations draws on some the 4E Player’s Handbook for rules and character generation, the only Character race allowed into the world setting from the PHB are Humans. All other PHB races are superseded by new Fae Races of the Amethyst setting. 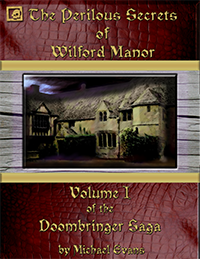 The Author created seven new Player-Character Fae Races, and each one is quite unique, although there are some superficial similarities to races published in current and previous versions of Dungeons & Dragons. Any similarity, however, might be due to the fact that these new races are supposed to have been heralded in the minds of Humans as myths and legend, which of course is what the founders of D&D used to create their PC Races! But please note that the descriptions, backgrounds, and role-playing tips on playing these new races are all quite original, and if I refer to a particular race as being “like” a D&D Player Race, I certainly mean no slight to the Author. Chapparans: both aboriginal and elven in nature, they are in tune with forests and are fierce warriors. The closest D&D equivalent might be Wild Elves. Damaskans: these fae are scholarly and reserved, and almost timid. They have a real thirst for lore and knowledge, and remind me of a cross between High Elves and Star Trek Vulcans. Gimfen: are agile and talkative, and have a passion to learn about technology. As I read about them, I thought of both Gnomes and Halflings, with perhaps a touch of elf thrown in. Laudenian: here are very tall (over 7’), lithe, and ancient fae, that are extremely arrogant. They bring to mind D&D Eladrin but are a bit more complex. Narros: are a short fae race, militaristic and focused, and most likely gave rise to human myths about dwarves and trolls. But they are neither, and call to mind both Dwarves and Hobgoblins by their natures. Tilen: were perhaps the most intriguing race, being fae that were tainted by evil but who escaped that darkness. These are not “dark elves”, but were instead fae that were enslaved by evil undead powers from the dark magic gate. These undead entities, called ghulath, tainted the Tilen, so that they now are a beautiful fae race which bears quite a resemblance to vampires – pale, fanged, and with glowing red eyes when angered! But these magical beings are actually kind, and they hate and despise undead, which makes them something like a revanent and an elf at the same time. The Evolved Races of Amethyst: Foundations are humans, as previously mentioned, and for the most part have abilities as listed in the 4E Player’s Handbook. However, the Author makes a very important distinction between the Echan Humans – those that embrace magic – and the Techan Humans – those that embrace technology. Echan Humans: live in towns outside the bastions, and have thrown their lot in with the fae, learning to manipulate magical forces. Over time, they become fae-like and can no longer utilize technological devices. Techan Humans: these humans live in bastions, and Player-Characters of this race typically belong to various organizations, usually of a para-military or military, or governmental nature. They can use technology, and have their own unique Character Classes, which do not utilize magic of any kind. The Author introduced a very interesting game mechanic to the humans of the world of Amethyst – the Saturation Point. Humans have a Saturation Point where they have used too much magic, and technological devices no longer work for them. Since magic disrupts technology, and vice versa, the Saturation Point is a fairly significant game mechanic to humans, and effects how they live in the world. There are some Fae-Human hybrids possible, and even mixing races among the Fae, but the Author seemed to suggest that it was fairly rare. Certainly, such an offspring of two races would have trouble coping in the world, although it would certainly be interesting to role-play. The discussion on races was very involved, and the Author did a great job of nailing down traits to allow Players to portray them. I was really amused at the section on social customs, including an extensive discussion on hand gestures and how each race reacts to them. Even the most innocent gesture might be interpreted as threatening, provocative, or an invitation to a sexual liaison! All basic D&D 4E Player’s Handbook Classes exist in Amethyst: Foundations, except for Clerics, Paladins, and Warlocks. Religious implications play in here, as the advent of magic did nothing to make any supreme being or deity more active in the affairs of the world than exists now. There is no Forgotten Realms Time of Troubles happening in this world setting! So classes drawing their powers from divine or infernal origins would not really fit in here. However, the Author does introduce four new Character classes that can be utilized by Techan Humans: Grounders, Marshalls, Operators, and Stalkers. Please feel free to check out Part 2 of this blog on Wednesday of this week, for more details about the Techan Human Classes, as well as information on other new mechanics, feats, and Paragon Paths in the Amethyst: Foundations Sourcebook. This entry was posted by Editor-in-Chief on Monday, April 12th, 2010 at 5:25 am	and is filed under RPG News & Reviews. You can follow any responses to this entry through the RSS 2.0 feed. You can leave a response, or trackback from your own site. So if there is conflict between the technological and magical sides how do you create a party of characters with both represented? Or do you have to pick a side? It seems that there would be constant problems with half the characters being able to enter the techie towns and half being able to enter the magic towns. That would be interesting for a while but could get tiresome very quickly at which point the campaign setting would become a generic mish mash of tech and magic. Sounds very like Torg to me – I’m looking forward to digging out my old Torg adventures and updating them. .-= Doktor Avalanche´s last blog ..Pre-Release Review of Amethyst: Foundations by Dias Ex Machina (Part 1) =-. It is possible to mix groups of techan and fantasy characters, but it is not possible to mix technology and magic on the same character…at least not in the canon setting. The story does encourage conflict between the two sides, making a mixed party dynamic and much more interesting.